Green and Glassie: The Wonders of Ice! Lake Michigan is 87% frozen and still freezing. This has been one of the coldest winters in history for Wisconsin. 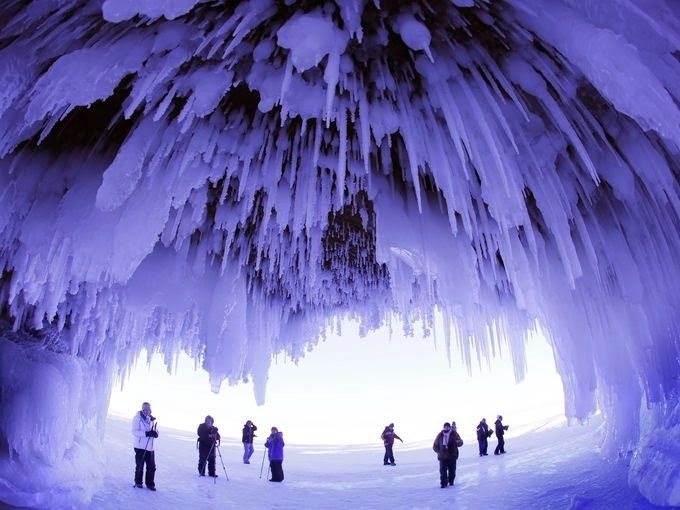 Lake Superior is frozen to the point that people can walk on the ice to view the Lake Superior Ice Caves. In Wisconsin when the weather is extremely cold the Great Lakes freeze. 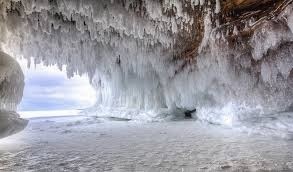 When that happens we are able to see the beautiful Lake Superior Ice Caves .... Apostle Islands National Lakeshore. Cave ice that can only be seen when the water of Lake Superior freezes hard enough for us to walk on the ice to the caves. 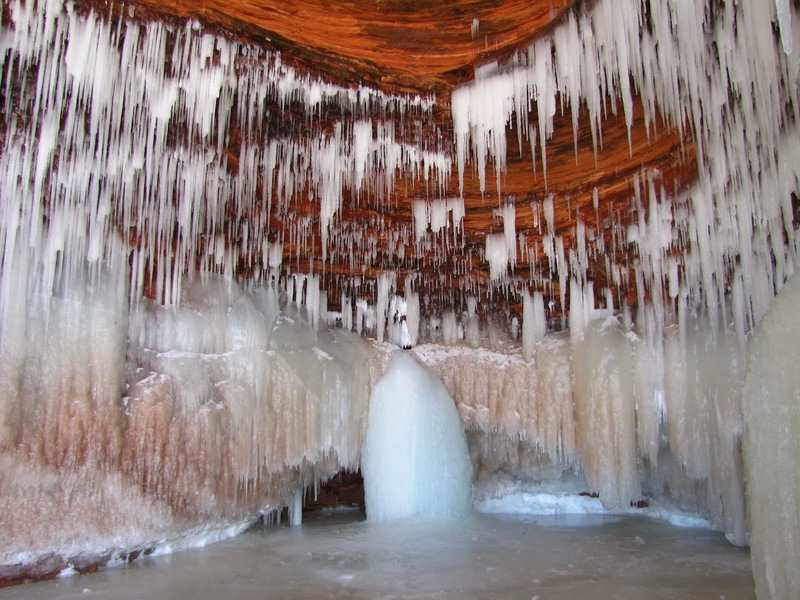 The caves are located near Bayfield in northern Wisconsin on the shores of Lake Superior. Gosh .... Mother Nature is beautiful! So I guess this cold severe weather is necessary to remind us that life with no cold would not be a good thing and can be beautiful! These are not photos that I took - they are photos shared by others. Whoa! That is beautiful! I would love to see this in person! STUNNING I'd just be afraid they'd fall OUCH! That is so cool. We had something sort of similar up in New Hampshire that we went to a few weeks ago. It's amazing what can be created out of ice! You can find abundant beauty even in this yucky winter weather! I love it. Thanks for sharing these amazing pics! This has been such a cold and snowy/icy winter but like LaVonne mentioned...we can find abundant beauty. Those photos are gorgeous. That looks so beautiful. I would love to visit. Those are absolutely amazing photos. Nature always finds a way (to be gorgeous), doesn't it! I always love looking at the wonders of nature. The ice photography is stunning. That is absolutely breathtaking! It's so good to have something wonderful to be able to enjoy despite the miserable weather. I'd love to see those in person someday! I didn't even know Ice caves were a thing, that's amazing. The pictures are absolutely fantastic. That just totally blows me away! I can't imagine what it must be like for almost an entire laze to be frozen! These are some gorgeous pictures! Wow! That last one is my favorite. Amazing! I would love to see this in person but I must be honest, I would worry about one of those falling on me. The pictures are so beautiful! I grew up in Michigan and never got to see the Lake Frozen. I miss the snow and ice living in Florida now. Neat cave - I went to Carlsbad Caverns a dozen times when I was young (El Paso, TX) So educational too. But I wished Mother Nature did not bring this ice to Texas today - She can have it Back~!! That is just gorgeous. I'd love to be able to see that in person! Wow! This is amazing! I would love to visit them one day! How incredible, Mother Nature is not messing around! That is totally silver lining for all those cold days you have had! As I read this post I am in the Northeastern US waiting for a snow storm, again. Your photos are indeed quite beautifl. I love all these pics. I have never seen cave ice before. That looks amazing! I'd love to visit one day. I'm not too far (Chicago area) so we could definitely make a road trip out of it. This is so cool and beautiful! My little boys would think this the coolest thing every. I know you are probably ready for spring. Those cave photographs are beautiful! I can't believe it's still so cold. 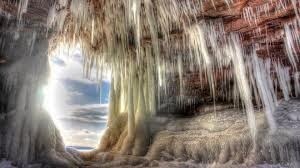 Those caves look amazing with the ice!! Although, I wouldn't want to walk into them. Hello Neighbor! I live in Michigan and we also can't believe the amount of snow and ice Lake Michigan is experiencing. Nature produces the best art... How beautiful is this and it looks designed too.